Mix all the ingredients together in a large container and you are ready to blow bubbles. I have found that the longer you let the solution sit the better it gets. 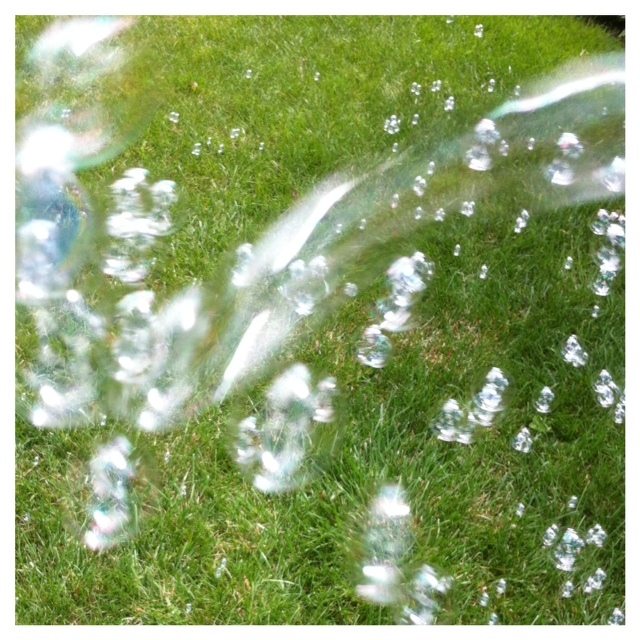 This blend makes large, strong bubbles and worked great in refilling our bubble gun! If you try it let me know how it turns out, I am curious to hear if others have the same results. Thanks for the recipe. We've tried many and they never work very well. I agree that Gazillion Bubbles are the best, but too expensive and too many spills= not worth it! We will try your recipe. I'm excited to try these but I can only find method dishwshing liquid and not detergent. Is that what I should be using? Hi Tracy! Yes, sorry I put detergent but it is actually called dish soap/dishwashing liquid. Let me know how it works! Works great and makes big, beautiful, fragrant bubbles! The best ive seen in a long time! However, they're definitely a bit more stinging to the eyes when they pop in your face! Wondering if i added too much soap? Howdy, is this exact blog is your one and only blog or you also own some others? the solution that comes with the bubble gun is done, We cant find the bubble gun juice that makes bubbles like the bottle that's come with the bubble gun. That liquid whatever is in it makes small floating bubbles and the bubble gun blow continuous small floating bubbles. Does anybody knows the ingredients that can make small light bubbles with the bubble gun ? We tried several recipes. It makes lots of bubbles... sure but they don't float like the Chinese recipe for the bubble gun . Does anybody knows the ingredients that can make small light bubbles for the bubble gun ? I think that the soap/water ratio is off. Do you mean 12 cups of water to 1 cup of soap? It seems as though every other recipe out there has a higher ratio of water. was this ever confirmed? is the ratio right or wrong? Good question. Is this really right?? One cup soap to two cups water? Can't find method brand locally. Can I use other brand? Check out amazon for method detergent. Also Target always carried it. We have a bubble gun that hasnt worked with store bought bubble solution (except Gazillion brand), I made this recipe and it works just as well as the Gazillion bubbles, except this smells better!